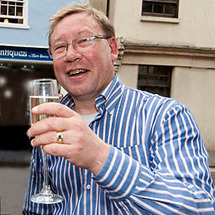 Bargain Hunt Expert Mark Stacey is probably one of the most flamboyant characters on the BBC Bargain Hunt antiques show. Mark Stacey was born in Neath, South Wales in 1964, where he grew up with his brother and two sisters. Later he moved to London where he started to work in the care profession. However Marks interest in antiques began with his love for history where he found he had a passion for Blue and White transfer printed ceramics. In London mark started his own successful antiques business before his expertise was noticed landing him a position in Bonhams Hove office in 1995. From here he moved to the auction houses of Sothebys specialising in ceramics and valuations for 5 years. (Mark has also been the Honorary Secretary of the “Friends of Blue”. The well known Ceramics collectors club). Mark also worked for Hamptons/Dreweatt Neate Fine Art, where as well as being a successful valuer he was head of Decorative Arts, and was later made a Director. But what of the man himself, I hear you ask? Ceramics, Lalique glass, theatre, and 50's and 60's collectables. He also has a passion for Spain where he likes to relax and read. On his dislikes Mark has much to say! There are so many but here are a few, BMW drivers, motorcycle riders who speed and push past you anywhere, rude people, bureaucracy, traffic lights that can always change to red when I get there, supermarket queues, my lottery numbers not coming up! . .
And on his resemblance to David Barby! With over 20 years experience and his individual humour on Bargain Hunt, Flog it, Antiques Road trip and more recently Put your Money where your Mouth is Mark Stacey is a well known and high profile TV and Radio antiques expert. For the last 15 years Mark has provided his services as an auctioneer and adviser to many charities within the UK and overseas, raising over £500,000 in the process. This handy-sized guide is the most accurate and up to date on the market. and has been the bible for for scholars, dealers and collectors, selling in hundreds of thousands.